Retail $20.99 SAVE 23% ! "Can&apos;t disagree - a little disappointing"
While I can&apos;t disagree with the other reviews, I suppose our expectations were lower to begin with for this E2X rocket. 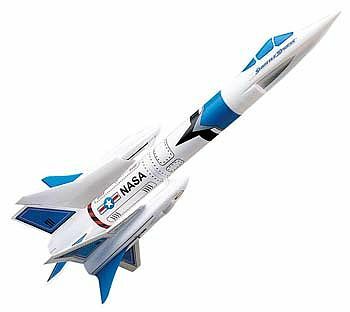 We gave this an average rating because of the following: Pros: *Cool factor - looks nice on the launch pad *Originality - The shuttles along for the ride have disengaged well on 3 separate flights without issue. *Reliability - The ejection and recovery of the rocket and its two shuttles were flawless on 3 flights. Cons: *Shuttles do sustain damage quite easily - they are made of inexpensive foam that is difficult to repair. *Shuttles do sort of tumble like leaves rather than glide as advertised (stole that description from another review because that description is spot on). Conclusion? There are better rockets from Estes in this price range. Flights up to 586 feet. "Different experience from the other reviewers"
The concept of this rocket looks better than it actually performs. This rocket is easy to build. However, the shuttles only disengaged correctly if I was using a C engine. The shuttles break very easily. We had only a hand full of launches before the shuttles became unusable. "Buy it for the nose cone only"
This one was a huge disappointment. The gliders disengaged fine, but then floated down like dead leaves instead of gliding, and nothing we tried could change the flight path. The cockpit nose cone can be used to clone an Estes Greyhawk, but that&apos;s the best I can do as far as a recommendation.